A round-up of the recent debate over the U.S.-China relationship, and how best to fix it. Those interested in China, particularly on a foreign policy front, have likely noticed a burgeoning debate in the United States over how best to deal with China’s “assertive” behavior in the South China Sea, cyber space, and elsewhere. Today’s links round-up pulls together the various pieces of the debate, which will have enormous consequences for the Asia-Pacific and the world. The long-simmering debate heated up when Robert Blackwill and Ashley Tellis argued in a new report that “Washington needs a new grand strategy toward China that centers on balancing the rise of Chinese power rather than continuing to assist its ascendancy.” Blackwill and Tellis summed up their 54-page report in an April 2015 article for the National Interest. The crux of their argument is that Washington’s attempts to integrate China into the international order have damaged U.S. interests — instead, the United States should seek to balance China (they are careful to avoid arguing for outright containment), for example by strengthening regional alliances. We can see this idea in action in calls for the United States to respond more forcefully to China’s land reclamation activities in the South China Sea. Offering a different perspective, former Australian Prime Minister Kevin Rudd released his own report, arguing that the United States and China can best avoid conflict by “placing their relationship on a stable, long-term footing.” Rather than seeking to balance China, Rudd argues, the United States should increase its effort to work with China to create a common vision of the Asia-Pacific region and the world – a vision based on “constructive realism” in areas where the two sides are fundamentally at odds (for example, the Taiwan question, the issue of human rights, and the South China Sea disputes). David M. Lampton, the director of China studies at the Johns Hopkins School of Advanced International Studies, echoes Rudd, but with more focus on how U.S.-China relations are currently going off the rails. In a speech on May 6, 2015, Lampton points to a “tipping point in U.S.-China relations”: “Our respective fears are nearer to outweighing our hopes than at any time since normalization.” Lampton’s suggestion: accommodation on the part of the United States and reassurance on the part of China. 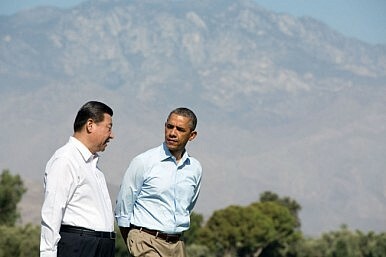 “The words ‘accommodation’ or ‘compromise’ in either China or the United States should not be dirty words,” he argues. Lampton’s speech pairs nicely with a ChinaFile essay by Orville Schell, the director of the Center on U.S.-China Relations at the Asia Society. Schell also sees a worrisome change toward pessimism and distrust in the relationship. Most shocking, Schell writes, is that “there is presently no significant core constituency in America still well-disposed towards China” – not even the businessmen who were once the most enthusiastic champions of U.S.-China ties. In an example of the personal consequences of eroding U.S.-China relations, the New York Times covers the story of Sherry Chen, a Chinese-American who worked for the National Weather Service before being accused of espionage. The charges, based on Chen’s interaction with an old classmate who is now a vice minister in China were abruptly dropped, without explanation. In Chen’s case, “it’s clear there was a little bit of Red Scare and racism involved,” former federal prosecutor Peter Toren told the Times.